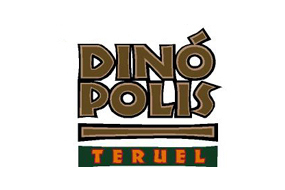 Dinopolis territory has a large main park, Dinopolis, located in the same city of Teruel and six centers more located in different towns of the province of Teruel: Legendark (Galve), Inhóspitak (Peñarroya de Tastavins), Amber region ( Rubielos de Mora), Stony Forest (Castello), Mar Nummus (Albarracín) and Titania (Riodeva), in whose exhibitions we can enjoy the fossils found near these municipalities. Dinopolis (Teruel) is a paleontological park where you can enjoy science and feel so closet o the dinosaurs world. To do this, this unique park in Europe proposes us a tour of 4.5 billion years through attractions such as the thematic tours of ‘ The journey in time ‘ or ‘ The last minute ‘, the virtual simulator 4d ‘ Terra Colossus ‘, the Paleosenda, the 3d cinema, the Sauriopark, and shows like the ‘ Show of the T-Rex ‘, one of the most sophisticated animatronic of the world that recreates with precision a Tyrannosaurus rex. A park that allows us to enjoy also a spectacular paleontological museum with more than 500 pieces among original fossils, many of them found in the province of Teruel as is the case of the original bones of Turiasaurus riodevensis, the dinosaur more Large of Europe described to date and one of the largest in the world, with almost 40 meters long and 40 tons of weight that was found by the paleontologists of the Dinopolis Foundation in Riodeva. Also a real reproduction of a Brachiosaurus or a Tyrannosaurus Rex in attack position, among others. In Teruel, a young man named Juan Diego Martínez de Marcilla fell in love with Isabel, Pedro Segura’s daughter. The father had no other daughter and was very wealthy. They loved each other very much. The young man wished to marry her, she replied that her desire was the same, but she would never accept if his father and mother did not allow it. He was a good young man, but he was poor. The young man told Isabel that, as his father only despised him for the lack of money, if she wanted to wait for him for five years he would go to work by sea and land where necessary to earn money. She promised. After five years the father said to her: “Daughter, my wish is that you take company.” She, seeing that the five-year period had passed and knew nothing of Diego, said she would. Then the father married her, and soon was wedding; And Diego came back. Diego went to Isabel´s home and said “Kiss Me, or I die.” And she rejoined: “God forbid I should miss my husband. By The Passion of Jesus Christ I implore you to seek another, that you do not realize from me, for if God has not complacid, I am not pleased”. He said again: “Kiss Me, or I die.” She reposed, “I don’t want to.” Then he fell dead. She, who saw him as if day by the great light of the room, began to tremble and woke the husband saying that he snored so much that it made him feel afraid, to tell him something. And he told a mockery. She said she wanted to count another one. And she told him what happened and how with a sigh Diego had died. Said the husband: “Oh, wicked. And why hasn’t it happened? ‘ She rewrote: “For not missing my husband.” “Verily, he said.” He, all altered, got up and did not know what to do. He said: “If people know that it is dead here, they will say that I have killed him and be put in great trouble.” They agreed to strive and took him to his father’s house. They were not heard by anyone. The young lady thought of how much Diego loved her and how much he had done for her, and because of one kiss he has died. She went to the Church to kiss him before the funeral; He went to the Church of Lord Saint Peter, who had it there. She cared nothing more than to go to Diego. She discovered his face and kissed it so hard that she died there. The people who saw that she, who was not a relative, was so recumbent about the dead, they saw that she was dead. The husband told the case to everyone in front, as she had told him. They agreed to bury them together in a grave. Together forever. Aragonese Mudejar Architecture is an esthetic current within the Mudejar art in Aragon (Spain) and has been recognized in some representative buildings as a World Heritage Site by UNESCO. The chronology of the Aragonese Mudejar is from the 12th to the 17th century and includes more than a hundred architectural monuments located predominantly in the valleys of the Ebro, Jalón and Jiloca, where the population of Mudejars and Moorish was numerous, which maintained their traditions, and the stone was scarce. The first manifestations of the Aragonese Mudejar have two origins: a monarchical architecture, which reforms and extends the “Palacio de la Aljafería” maintaining the Islamic ornamental tradition and Muslim alarifs. A popular architecture that links with the Romanesque and begins to elaborate its brick constructions arranged on many occasions in ornamental traces of rooted Moorish, which can be observed in churches of Daroca which, they were refinished in the 13th century with Mudejar brick cloths. 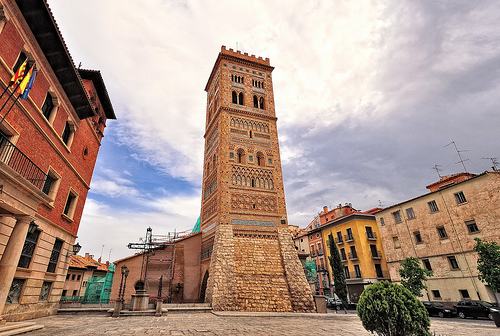 The San Martín Tower of Teruel is a building of the Aragonese Mudejar cataloged in 1986 as a World Heritage site. It was built in 1316 and reformed in the 16th century, in which a stone base was added. It was built between 1315 and 1316 and reformed in 1550 by Pierres Vedel, which eliminated townhouses to leave an open square before the tower and built a reinforcement in its base to repair and prevent the degradation of its lower part. In 1926, Ricardo García Guereta embarked on an important restoration; In the Spanish postwar Manuel Lorente Junquera again intervened in the tower restoring ceramic pieces with a shade more tenuous than the original. Between 2002 and 2007 there was a complete restoration, inside and outside, by which was recovered the old entrance from under the tower. It is located in the Pérez Prado Square, opposite the street of the lovers. 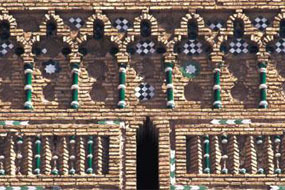 It is, like other of the towers of the capital Teruel, a tower-brick door with ornaments of glazed ceramics under which passes the slope of the Andaquilla. It is practicable at its base through a pointed vault. In the first body are visible three of their faces, as the fourth is attached to the church of San Martín, Baroque period. The tower mimics the structure of the Almohad minaret with two concentric square towers among which are located the stairs. The inner tower has three overlapping floors covered with a ribbed vault. Of that campaign nothing impressed me as much as the incredible bad weather, and I am sure that for the historians of the war it will be the most worthy trait of study. The cutting wind was especially hard. Nothing served as a protection against the icy gusts that came howling from the north and crossed all layers of clothing, however many. The eyes were constantly filling us with tears because of the intense pain; The fingers swelled and we fell asleep and the feet disappeared any sensation that was not an unbearable frigid coldness. 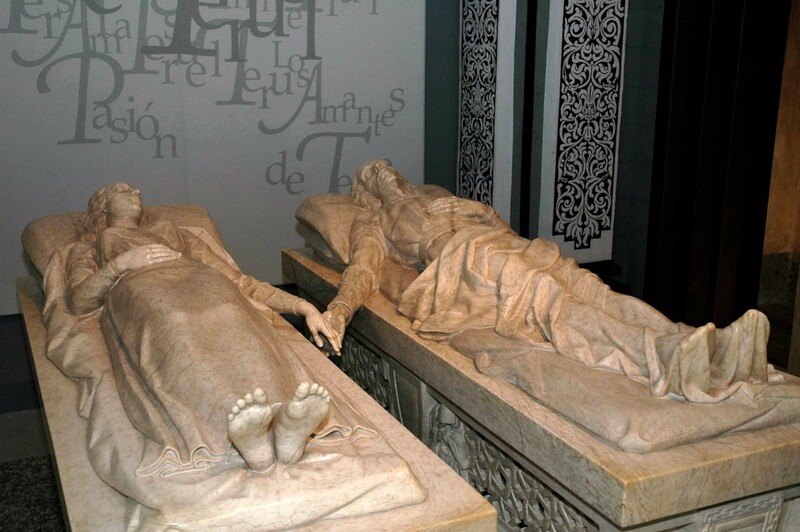 Now you can visit the rests of the Fight of Teruel, have created a series of routes to visit the most prominent places around the city and observe the rests live. Strategic places are in high points of the city with an amazing view of the whole territory. You can also enter these links to schedule your visits, you can stay in our apartments where we will indicate the most advisable routes.